Cats can be picky about their toys and often prefer something interactive where their favorite person plays with them. Dogs usually love anything they can get their paws on. Choose toys for them before they find something of their own! Which toy to buy will depend on your dog. Larger dogs require larger toys, and may even choke on toys intended for smaller pets. Different dogs like different things, and some toys are harder to destroy than others. Use common sense, and try to see it from your dog’s point of view. Find something with an appropriate size. A very large toy isn’t much fun for a tiny dog who can barely move it, and something too small can be swallowed or choke your dog. Remove ribbons, strings, and similar that can be chewed off and swallowed. 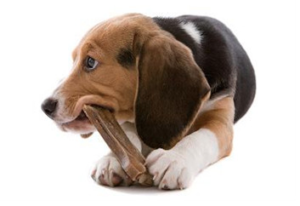 You don’t want to risk an object getting stuck in your dog’s intestinal tract. Rope toys and similar that are braided with knotted ends should be replaced when they’re chewed, to prevent the dog from swallowing any parts of them. Supervise play with squeaky toys. Dogs love shaking these toys and tearing them apart, and the squeaker shouldn’t be eaten. Avoid toys made for human children. The filling can be very dangerous and may even cost a dog’s life. Not even pet-safe fillings are meant to be eaten. Keep strings, rubber bands, ribbons, and similar out of reach, to prevent your pet from swallowing them.